Valley of the Queens, Luxor, Egypt. Dynasty xix 1270 B.C. The tomb of Nefertari, from which this wall fragment comes, is the largest architectural and decorative enterprise ever dedicated to a Pharaoh�s wife. 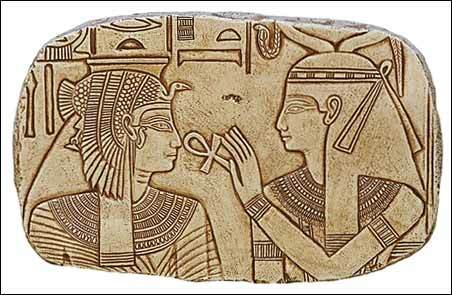 Nefertari was the chief Queen and favorite wife of Ramses II. The name Nefertari means �the most beautiful of them�. Ramses II devoted the minor temple of Abu Simbel to the Goddess Hathor and dedicated it to Nefertari. There, identified with the Goddess, Nefertari intensely participated in the divine cult. Nefertari gave Ramses II his firstborn son as well as three other sons and two daughters. Nefertari died in her forties. Here, Nefertari receives the breath of life from Isis, the Mother Goddess.